This is a good solution if you don't need temperature readings or an audible siren, and you're using an Intseon hub. With a list price of $35, and sales prices that are routinely lower, the Insteon Water Leak Sensor is one of the cheapest flood detection solutions on the market. But of course, you get what you pay for. Insteon’s sensor lacks an audible alarm, outlet power, temperature readings, and extension cable support. And because the sensor only works with Insteon hubs, your integration options are limited. Once set up, you can drop the sensor anywhere, with no wiring necessary. 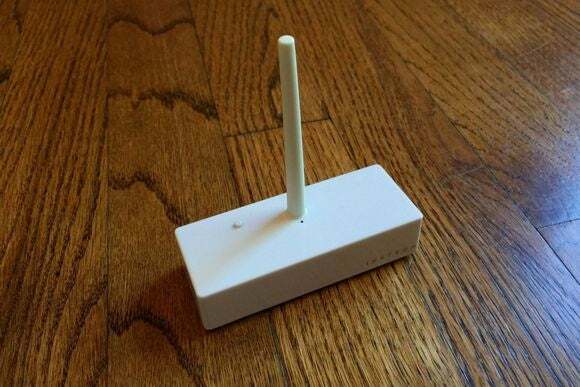 It occupies a narrow footprint at 3.6 inches long by 1.4 inches wide, though it does have a vertical antenna that keeps it from fitting under washing machines or other low-clearance spaces. 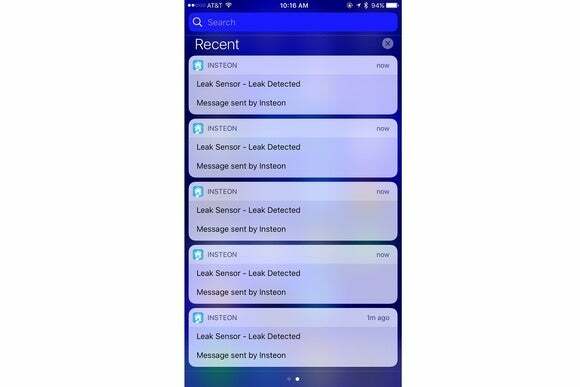 Insteon gets all up in your notifications when it detects a leak. 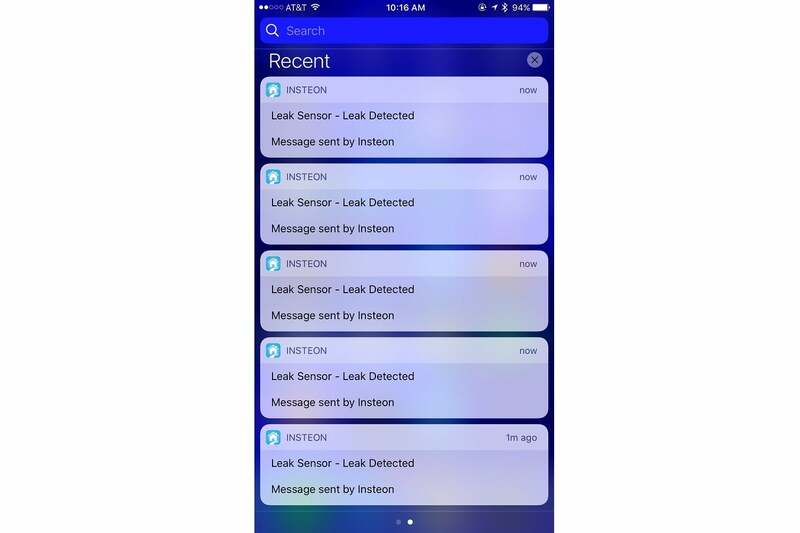 Beyond those notifications, Insteon’s app is sparse in terms of information. There’s no way to look up history, so you can’t tell precisely when the leak occurred. And while Insteon claims the sensor lasts 10 years on a single AA battery, the app doesn’t display battery status. The sensor merely checks into the app every day to let you know it’s still working. The sensor itself also has one unintuitive attribute: Once you’ve dried off the sensor, you need to press the the pairing button to report that the leak has cleared up. There’s no way to do so from your phone. 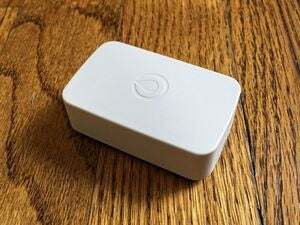 Because Insteon uses a proprietary connection, you can’t connect the Water Leak Sensor to other hubs, such as Wink and SmartThings. Insteon’s system doesn’t support IFTTT either, for things like automated phone calls and activity logging to Google Sheets. That said, the sensor does communicate with other Insteon devices, such as alarm modules, water shutoff valves, and light bulbs. 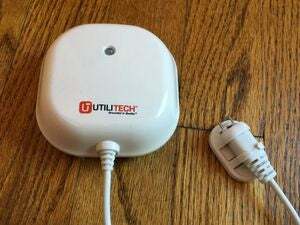 The lighting connection doesn’t even require an Insteon hub, though you won’t get phone or email alerts without it. Although Insteon’s Water Leak Sensor lists for $35, you can easily find them these days for about $20 each. That means a hub system ($80) with four sensors would cost around $160, far less than other solutions we’ve tested. Just keep in mind that the sensor can’t do as much to keep you informed. 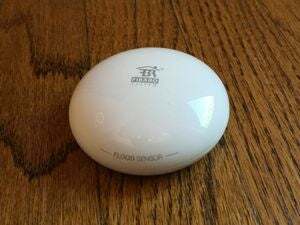 Insteon is an inexpensive solution, especially if you need lots of sensors, but its leak detector doesn't offer much in the way of features.